For other uses, see Barge (disambiguation). "Bargee" redirects here. For the type of food known as bhajji, see Pakora. "Unmanned barge" redirects here. It is not to be confused with Unmanned surface vehicle. A barge is a flat-bottomed ship, built mainly for river and canal transport of heavy goods. Some barges are not self-propelled and must be towed or pushed by towboats, canal barges or towed by draft animals on an adjacent towpath. Barges contended with the railway in the early Industrial Revolution, but were outcompeted in the carriage of high-value items due to the higher speed, falling costs and route flexibility of railways. This article contains hieroglyphics. Without proper rendering support, you may see question marks, boxes, or other symbols. The long pole used to maneuver or propel a barge has given rise to the saying "I wouldn't touch that [subject/thing] with a barge pole." Accommodation barge = Hotel "Ships"
On the British canal system, the term 'barge' is used to describe a boat wider than a narrowboat (seven feet or 2.1 metres), and the people who move barges are often known as lightermen. On the UK canal system, boats wider than seven feet (2.1 m) are often referred to as widebeam. In the United States, deckhands perform the labor and are supervised by a leadman or the mate. The captain and pilot steer the towboat, which pushes one or more barges held together with rigging, collectively called 'the tow'. The crew live aboard the towboat as it travels along the inland river system or the intracoastal waterways. These towboats travel between ports and are also called line-haul boats. Poles are used on barges to fend off the barge as it nears other vessels or a wharf. These are often called 'pike poles'. Barges are used today for low-value bulk items, as the cost of hauling goods by barge is very low. Barges are also used for very heavy or bulky items; a typical American barge measures 195 by 35 feet (59.4 m × 10.7 m), and can carry up to about 1,500 short tons (1,400 t) of cargo. The most common European barge measures 251 by 37 feet (76.5 m × 11.4 m) and can carry up to about 2,450 tonnes (2,700 short tons). As an example, on June 26, 2006, a 565-short-ton (513 t) catalytic cracking unit reactor was shipped by barge from the Tulsa Port of Catoosa in Oklahoma to a refinery in Pascagoula, Mississippi. Extremely large objects are normally shipped in sections and assembled onsite, but shipping an assembled unit reduced costs and avoided reliance on construction labor at the delivery site (which in this case was still recovering from Hurricane Katrina). Of the reactor's 700-mile (1,100 km) journey, only about 40 miles (64 km) were traveled overland, from the final port to the refinery. Self-propelled barges may be used as such when traveling downstream or upstream in placid waters; they are operated as an unpowered barge, with the assistance of a tugboat, when traveling upstream in faster waters. Canal barges are usually made for the particular canal in which they will operate. Many barges, primarily Dutch barges, which were originally designed for carrying cargo along the canals of Europe, are no longer large enough to compete in this industry with larger newer vessels. Many of these barges have been renovated and are now used as luxury hotel barges carrying holidaymakers along the same canals on which they once carried grain or coal. In primitive regions today and in all pre-development (lacking highways or railways) regions worldwide in times before industrial development and highways, barges were the predominant and most efficient means of inland transportation in many regions. This holds true today, for many areas of the world. In such pre-industrialized, or poorly developed infrastructure regions, many barges are purpose-designed to be powered on waterways by long slender poles – thereby becoming known on American waterways as poleboats as the extensive west of North America was settled using the vast tributary river systems of the Mississippi drainage basin. Poleboats use muscle power of "walkers" along the sides of the craft pushing a pole against the streambed, canal or lake bottom to move the vessel where desired. In settling the American west it was generally faster to navigate downriver from Brownsville, Pennsylvania, to the Ohio River confluence with the Mississippi and then pole upriver against the current to St. Louis than to travel overland on the rare primitive dirt roads for many decades after the American Revolution. Once the New York Central and Pennsylvania Railroads reached Chicago, that time dynamic changed, and American poleboats became less common, relegated to smaller rivers and more remote streams. On the Mississippi riverine system today, including that of other sheltered waterways, industrial barge trafficking in bulk raw materials such as coal, coke, timber, iron ore and other minerals is extremely common; in the developed world using huge cargo barges that connect in groups and trains-of-barges in ways that allow cargo volumes and weights considerably greater than those used by pioneers of modern barge systems and methods in the Victorian era. Such barges need to be towed by tugboats or pushed by towboats. Canal barges, towed by draft animals on a waterway adjacent towpath were of fundamental importance in the early Industrial Revolution, whose major early engineering projects were efforts to build viaducts, aqueducts and especially canals to fuel and feed raw materials to nascent factories in the early industrial takeoff (18th century) and take their goods to ports and cities for distribution. The barge and canal system contended favourably with the railways in the early Industrial Revolution before around the 1850s–1860s; for example, the Erie Canal in New York state is credited by economic historians with giving the growth boost needed for New York City to eclipse Philadelphia as America's largest port and city – but such canal systems with their locks, need for maintenance and dredging, pumps and sanitary issues were eventually outcompeted in the carriage of high-value items by the railways due to the higher speed, falling costs and route flexibility of rail transport. Barge and canal systems were nonetheless of great, perhaps even primary, economic importance until after the First World War in Europe, particularly in the more developed nations of the Low Countries, France, Germany, Poland and especially Great Britain which more or less made the system characteristically its own. Nowadays, custom built special purpose equipment called modular barges are extensively used in surveying, mapping, laying and burial of subsea optic fibre cables worldwide and other support services. Barge on the river Mosel in Germany. YFN-958 a covered lighter barge, non-Self-propelled. Built by Mare Island Navy Shipyard in 1944. ^ Randolph Henry Spencer Churchill (1885). H. W. Lucy, ed. Speeches of Lord Randolph Churchill. ...never was land so easily and cheaply in the grasp of the capitalist as it is now, if he chose to put out his hand, and yet there is not a capitalist in his senses who would touch it with a barge pole. Look up barge or bargee in Wiktionary, the free dictionary. 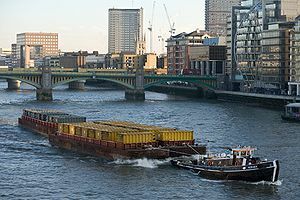 Wikimedia Commons has media related to Barges. Chisholm, Hugh, ed. (1911). "Barge" . Encyclopædia Britannica (11th ed.). Cambridge University Press.